One of the most thrilling things about watching Nico Muhly’s new opera, Two Boys—which I saw last night at the Met—was being carried along by the story from beginning to end. As a big fan of noir films, and detective procedurals, it felt like a novelty to see a whodunnit unfolding on the opera stage. On first viewing, it was as much a theatrical event as a musical one, in the sense that the plot was driving the action. Why did that feel like a revelation? It had moments of strange beauty that were often surreal; and then there was the wondrous choral polyphony—at which Muhly excels—of the final scene. The playwright Craig Lucas based his libretto for the opera on true events, which happened ten years ago in Manchester. After the opera, I immediately sought out the original story (on the internet, of course) and ended up reading Judy Bachrach’s 2005 Vanity Fair piece, “U Want 2 Kill Him?“, which went into considerable depth on this strange tale of two boys who found each other on the internet, via chat rooms, and culminated in a bizarre murder plot. I have to say Lucas did great justice to this complex tale, managing to fold in the key plot points into this relatively short opera. But what also interested me, as a journalist, was the fact of an opera based on non-fiction narrative. Of course, there are examples of opera being based on true events—recent examples might include Anna Nicole (Mark Anthony Turnage), Nixon in China, Death of Klinghoffer, Doctor Atomic (John Adams), and Dead Man Walking (Jake Heggie). But it seems especially noteworthy when a piece of art is spun from a piece of narrative journalism. It’s a special kind of story that lends itself to opera. I was fortunate to work on one, as the researcher on James B. Stewart’s 2002 book, Heart of a Soldier, a remarkable true story about a British man, Rick Rescorla, whose biography was the stuff of a Boy’s Own adventure. In some ways the story was old-fashioned in that it was an epic story, with themes of love and heroism that culminated in a dramatic finale on September 11, 2001. 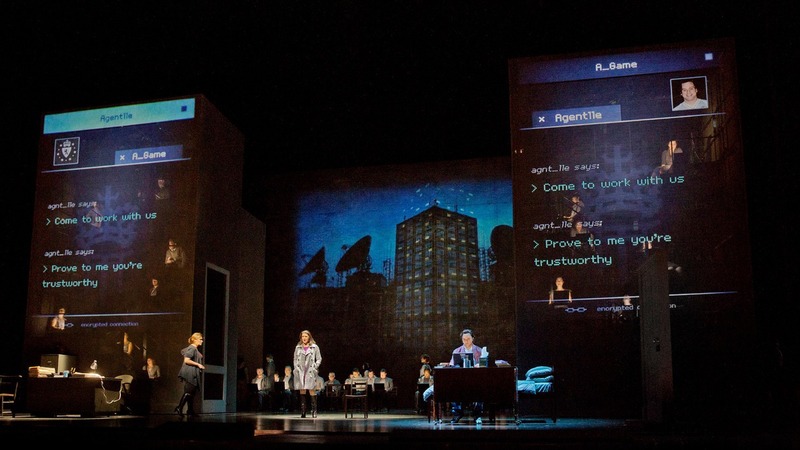 The San Francisco Opera commissioned an opera (composed by Christoper Theofanidis, libretto by Donna Di Novelli), which had its world premiere on the tenth anniversary of 9/11. Of course this story was quite different from Muhly’s opera. But what elements must a nonfiction story contain to make it right for opera, or shall I say, grand opera? Maybe the composer and critic Edward Rothstein was onto something with the following thought: “… an opera is usually a public event, a narrative meant to communicate something out of the ordinary.” In this regard, Muhly’s opera fits the bill. It’s an extraordinary exploration—using technology as a conduit—of an ongoing human problem. Loneliness. 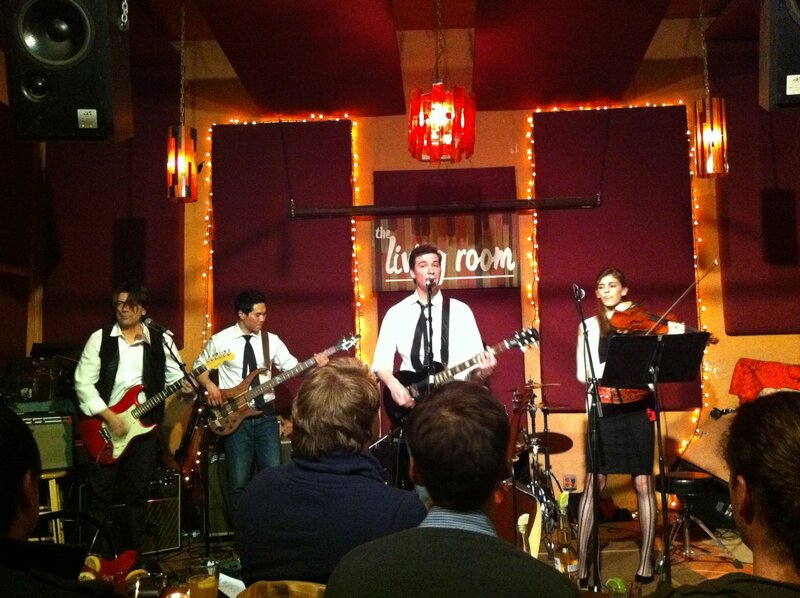 Here’s hoping The Living Room folks find another great space. Their last night was Saturday, October 26. Meanwhile the old space is up for rent at $19,000 per month. I predict another upscale tapas place, with $15 cocktails. Oh Lower East Side where did you go? A new play by the Tony Award winning playwright, David Henry Hwang, has just opened on Broadway. 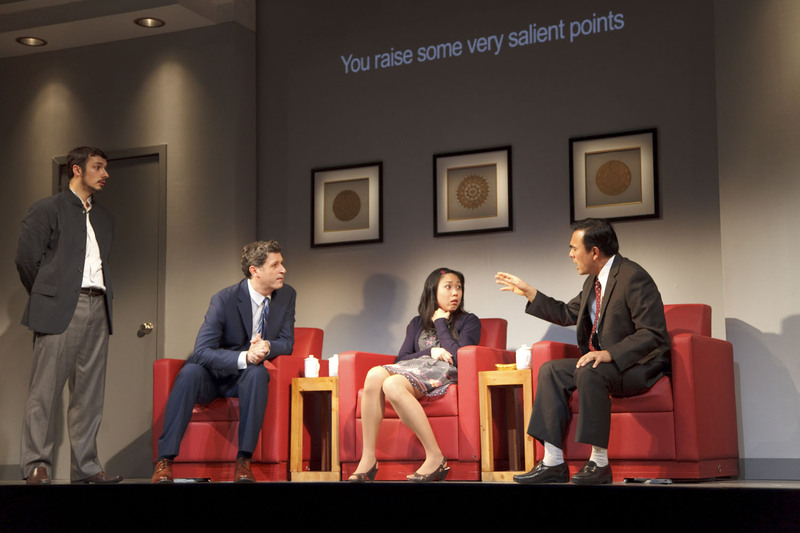 Chinglish is a comedy that explores the barriers of language and culture between the English-speaking world and China. It’s remarkable, not only because it opened without any big-name stars, but because a quarter of the play is written in Mandarin. OK, it does have surtitles (the kind you see in opera houses) and this works supremely well, allowing audience members in on the joke when one or more characters on stage are baffled by the confusions of language. Still, for a mainstream audience, the Chinese language appears to have arrived in a big way. I did this feature on the play for BBC World News America last week, and interviewed members of the cast as well as the cultural advisers on the show. But, as I looked into this, I discovered a long and rich history of Chinese theatre in the United States – though not for a mainstream (ie English-speaking) audience. From the middle of the nineteenth century Chinese opera troupes were touring in the United States. According to a study in the Cambridge Opera Journal, in 1852 there was a fully-fledged production staged in San Francsico by the Hong Took Tong, a 130-member trouple from China. In fact, there were many Chinese troupes touring all over the United States, including New York City, providing pleasure for the thriving Chinese-American community, which until the 1960s was predominantly Cantonese. In the 1930s, the visiting Chinese opera singer, Mei Lan Fang and his troupe came to Broadway to present their lavish Peking opera productions. 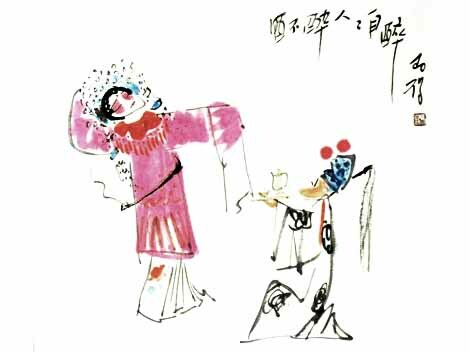 One of the operas he performed was The Drunken Beauty or The Drunken Concubine (the above is a colour plate depicting choreography from the opera). The music and style is a far cry from Broadway shows of the era – Gershwin’s Of Thee I Sing or Cole Porter’s Anything Goes (which is currently on Broadway again). I read that when Mei Lan Fang performed, he transfixed his American audience as well as the theatre critics with his grace and beauty. Here’s a silent film shot by Eisenstein from 1935 of Mei Lan Fang, a star in his own right who became friends with Hollywood in-crowd of the time, including Charlie Chaplin. More recently the acclaimed Chinese director Chen Kaige made a film about Mei Lan Fang called Forever Enthralled (2008) – which follows in the footsteps of Chen’s best-known film Farewell, My Concubine (1993). You can watch the entire film in HD on YouTube, here. One thing I’m curious about is whether Peking opera had any influence or impact on American musicals? On the face of it, not much. So David Henry Hwang’s idea to bring a little piece of China to the Broadway stage seems long overdue. Once upon a time, I studied English literature at a British University. We started out reading 19th Century English works and had to choose five authors. We were supposed to read all of their major stuff. That’s a tough proposition when you’re 19-years-old and want to get down to the pub ASAP. Such, such were the pressures of a British University Education. Some of us made the mistake of choosing writers like Charles Dickens whose oeuvre is pretty vast. A lot of reading. 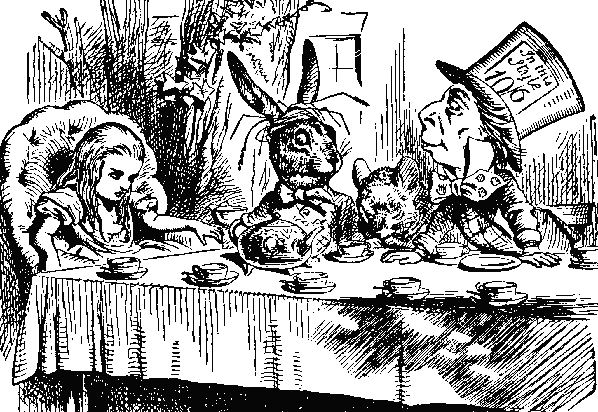 And then I discovered Lewis Carroll who was not only highly regarded as a Victorian writer, but didn’t write a vast amount of words. Also, there were those amazing John Tenniel illustrations. What fun! So I managed to read Carroll’s books and wrote some dubious essays about the brilliant wordplay, its symbolism, how it foreshadowed modernism. But little did I realize that, years later, I would end up writing a song inspired by Wonderland, which is kind of a dreamlike state where things get pretty weird. Who doesn’t love a good talking animal? 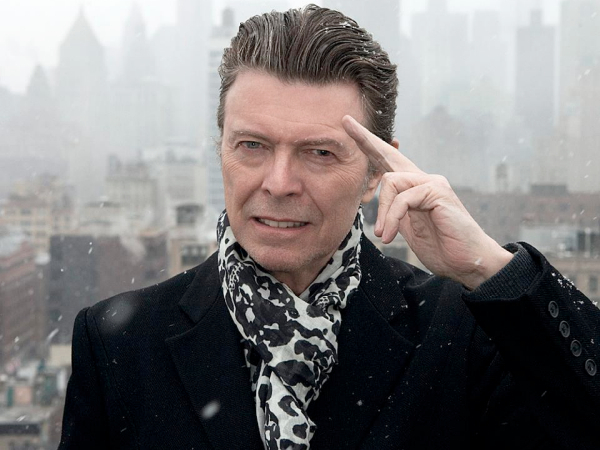 Anyway, here’s the song, Weird in Wonderland. Hope you like it.